Yesterday the team of SuperSoniqs went to the MSX meeting in Mariënberg to show Franky, the Sega VDP extension for MSX1 and higher. Not only did they manage to show some Sega games running on MSX, but they also showed MSX1 games running on Franky! Best thing of all was that there was no noticeable delay in speed during gameplay. The crowd played some games and spoke out their positive feelings about this project. It really was fun to see. A lot of people already asked how to obtain a card. Sadly this is still a prototype. However, SuperSoniqs might produce a larger sample batch for those interested. As it is unclear when the second prototype with the Sid chip will be ready, or even when that version is going to be produced on a larger scale, you might want to contact them for obtaining a sample. Please do note that estimated production costs for the current version will be around 20 euro for the PCB and about 20 to 25 euro for the parts needed, without soldered components. However, SuperSoniqs will publish a list of needed components and it will be possible just to obtain the PCB only. Or hopefully the PCB and a Sega VDP (they are busy with buying old stock). A youtube video with the demonstration of Franky has been published on their website. The first two might be very interesting for developers. This project is already a reality! Yesterday I had the pleasure to play "SonicBoy" on the Turbo-R running an MSX1 bios running the Sega bios addressing Franky ;p And loved it! It was also nice to see Salamander using the sega VDP. I'm a bit confused about sega vdps. What are the sprite capabilities of the chip? Anyone can point me or give some info about hw sprites? will the SID being memory mapped or I/O mapped? patterns can only use the second one. 4 screen. The Genesis VDP added mode 5, which is specific to the Genesis. the size of the name table is 32x32 instead. I don't know anything about soldering... there will be a soldered unit available?? I think because OPLL is already here and available. Otherwise, there are quite some Japanese SMS games that make use of the OPLL chip. But still, doing something that has already been done is less fun, I guess. About the loose component kits: hopefully SuperSoniqs find someone or some company who can solder everything together for a reasonable price. But it will probably add up to the costs of the final product, about 50% to 100% because of labour costs. Personally, I don't think people want to pay 100 euros to play around with this cart. 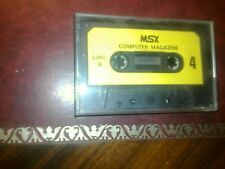 Maybe, if we find enough msx-ing people, friend or family, who can and will put things together (something like, make five, get one for free or something) we might have a solution. But the main goal should be: as cheap as possible. Partially true that opll is used but a) the combination isnot done b) leave the sid away and detect the opll instead c) ideas about casing? I don't think the combination SID and Sega on MSX has been tried before too ;P About casings: I hope it will fit in both the moonsound type cartridge and the one used for the Philips Barcode / Modem cartridge. They have a bunch of those. About the SID replayer: if you read the SuperSonics website, Guyver offered to help on the replayer. He already made a 6502 emulator core for MSX. I'm not sure if a MSX1 will be fast enough. Maybe there's a converter needed for the .sid files. Please note however, that .sid files couldn't be played on a real c64 for a long time. My guess is that the instructions for setting the Mos registers will be limited and mostly the same. There could be a lookup table made for doing the same on msx and then convert the .sid files to a format the MSX can execute. You mean ofcourse could use a bunch of ..
Well if they can manage to place the right place for the holes (moonsound as example). About the loose component kits: hopefully SuperSoniqs find someone or some company who can solder everything together for a reasonable price. But it will probably add up to the costs of the final product, about 50% to 100% because of labour costs. Personally, I don't think people want to pay 100 euros to play around with this cart. I'm neither going to pay 100 euros nor going to solder myself the PCB so, please, find someone who can produce the final cartridge! If this project is going to end with a DIY kit it won't be a success. "Succes" is a relative expression in our community I think. Nonetheless: where there's a will there's a way. We'll see.